Surface staining of mouse splenocytes using anti-CD18 antibody (clone M18/2). 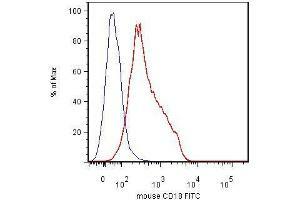 Specificity The rat monoclonal antibody M18/2 recognizes CD18 antigen (integrin beta2 subunit, beta2 integrin), a 95 kDa type I transmembrane protein expressed on all leukocytes. Endotoxin Level Endotoxin level is less than 0.01 EU/µg of the protein, as determined by the LAL test. Background CD18, integrin beta2 subunit, forms heterodimers with four types of CD11 Molecule to constitute leukocyte (beta2) integrins: alphaLbeta2 (CD11a/CD18, LFA-1), alphaMbeta2 (CD11b/CD18, Mac-1, CR3), alphaXbeta2 (CD11c/CD18) and alphaDbeta2 (CD11d/CD18). In most cases, the response mediated by the integrin is a composite of the functions of its individual subunits. These integrins are essential for proper leukocyte migration, mediating intercellular contacts. Buffer Azide free phosphate buffered saline (PBS), approx. pH 7.4, 0.2 μ,m filter sterilized.